What do I do if my crown fell off? If your crown fell off in an emergency situation, call 9-1-1. If it is after hours, you may leave a message on our answering machine, and someone will contact you on the next business day. Another option is to call Dr. Browne or Dr. Crowley (their emergency numbers are provided on our after-hours answering machine message). When possible, keep the portion of the crown that fell out to bring to your appointment. Seal and protect your tooth until your appointment (by cleaning and using the crown if intact or temporary filling material). Take over-the-counter pain medication such as Tylenol or Ibuprofen, as needed, to help control any discomfort or sensitivity. Here is a very detailed article from Little Rock Family Dental Care with more information on what to do if your crown falls out. How can you treat the missing crown? To treat the issue, we will sometimes be able to re-attach the crown in the initial appointment, either temporarily or permanently. However, if it continues to fall off, we have many available options. The most common treatment plan is to re-prep the tooth and remake the crown. Why did my crown fall off? A loosened or fractured internal screw of the implant crown. An abused crown (grinding your teeth, teeth used as tools, etc). 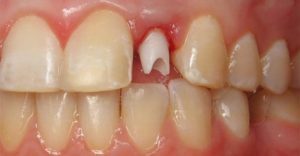 Not enough remaining tooth structure to retain a crown. If you would like more information, you can read where Oral Answers wrote an article on the six reasons why your crown fell off. What happens if I do not come in right away? Gum growth into the area. 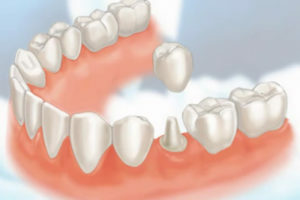 Movement of your teeth due to changes in bite and available space for teeth. Damage to remaining parts of the tooth. Also, keep in mind that the tooth can continue to decay, so delaying making an appointment for even a few days can negatively impact your oral health. Rather than allowing this to happen, we urge patients to call us immediately. How can I prevent my crown from falling off? One of the best methods for preventing a dental crown from falling off is for you to get regularly scheduled x-rays of your teeth. X-rays help us to see decay starting just under a crown margin. Therefore, we can try to identify vulnerable crowns before they fall out. Your hygienist will tell you when it is recommended to get x-rays.